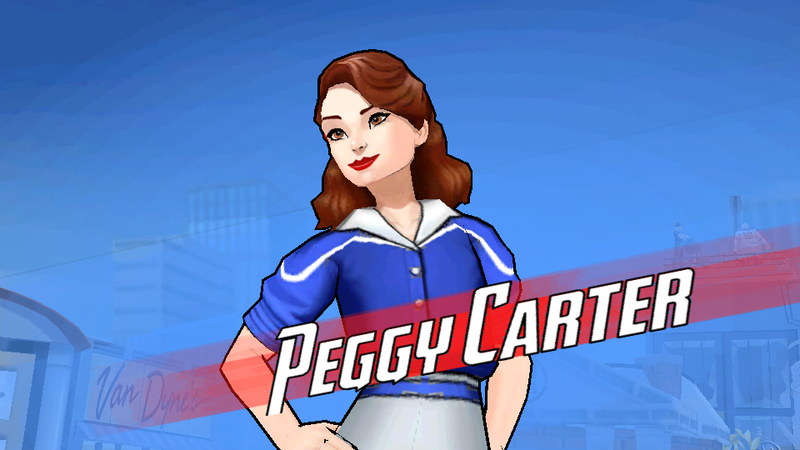 MARVEL AVENGERS ACADEMY: Free Character: Peggy Carter! Alongside the release of Episode 2 of the Daredevil Special Event it looks like we got something else coming to our games today! 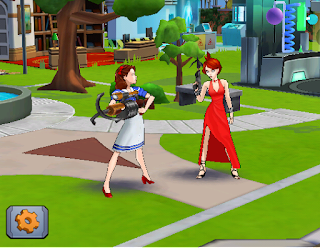 Peggy Carter: What's going on? Where am I? Howard? Peggy Carter: Exactly how many years have passed? Peggy Carter: Anthony Stark, what the hell did you do?! Pepper Potts: Agent Carter. I'm Pepper Potts. It's an honor to meet you. Peggy Carter: Thank you. I wish it were under less disturbing circumstances. Pepper Potts: We'll find a way to get you back, but we could really use your expertise. Your insight would be invaluable. Peggy Carter: If you don't mind me asking, why is everyone so familiar with me? Peggy Carter: Are you quite all right? Black Widow: Sorry, I'm just...You're one of my heroes. My only hero. I don't like most people. Pepper asked me to give you the tour. Peggy Carter: Then please lead me to the target range. I can't be getting rusty. Wasp: Oh my gosh, you're so totally fangirling for Agent Carter! Black Widow: I don't know what you're talking about. Wasp: Is she really as awesome as she sounds?! Is that even possible?! Black Widow: She has lipstick laced with sedative. She knocked a guy out with a chair once. She cusses when she doesn't hit a perfect bullseye. She's better than I ever could've imagined. Black Widow: One of the best parts about Avengers Academy is the tech. Probably because one of the worst parts is that it's filled with mad scientists. Peggy Carter: Some things never change. Black Widow: Do you wanna compare spy gear? Maybe? I'll show you some of the things they've built for me, and I'd love to see what you use. Peggy Carter: Darling, I would love that. Black Widow: I'd heard about that lockpick wrist watch, but I didn't think it was real. Peggy Carter: That was definitely the most fun I've had in seventy years. Thank you for everything, Black Widow. You do us spy girls proud. Peggy Carter: Are you alright? Black Widow: Yes. I definitely don't cry. Captain America: Sometimes I can't either. It's really good to see you, Peggy. Peggy Carter: I didn't think I'd ever get to see you again. I still can't believe it's real. Captain America: You basically started this place. It's incredible. I'm glad you got to see it. Peggy Carter: I'm glad I got to see you. It'll be strange going home after all of this. I don't know how I'll go back to fetching coffee. Captain America: The SSR doesn't realize how lucky they are to have you. Peggy Carter: I expect I'll show them, then. I'm looking forward to it. Peggy Carter: Is it just me, or does everyone here spend an extraordinary amount of time messing about? If Stark spends any more time in that hot tub his skin will fall off. Captain America: Yeah, it's a different era. More distractions. Different ideals. I try not to sound like the old man on campus, but it usually happens anyway. Peggy Carter: All of this leisure is unnatural. Why aren't we off fighting robots or whatever it is people do in the future? 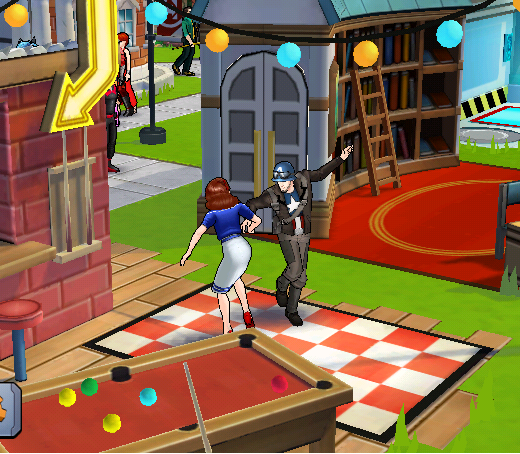 Peggy Carter: I should probably get back to work. I still have questions that need answers. Captain America: I know you'll find whatever you're looking for. Peggy Carter: We'll speak again. I'm not finished with you yet, Steve Rogers. Captain America: I hope not. Black Widow: I wasn't sure if this was a spy mission or not, so I brought a grappling hook and a cardboard box. Peggy Carter: There's so much I don't understand yet. My gut says I'm missing something important. Black Widow: Try checking the S.H.I.E.L.D. Database. If you can't find the answers you're looking for, you might find the right questions. 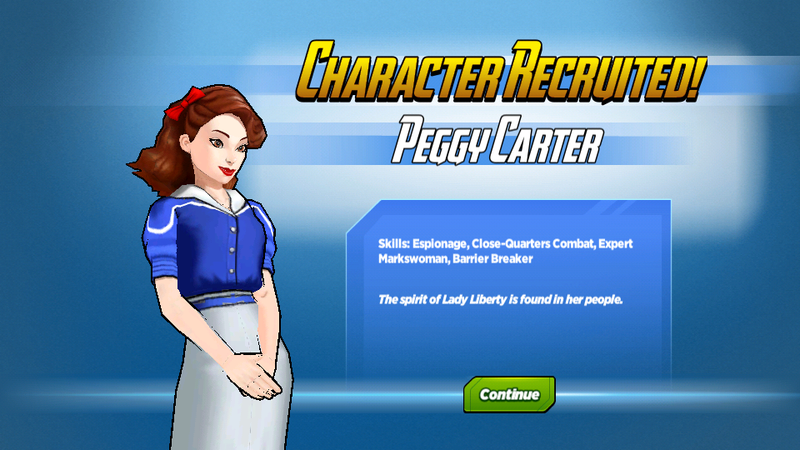 Are you excited to get Peggy Carter for free?! Isn't that awesome?! I try to get Peggy and Pepper says "log in" but that banner of Civil War doesn't appear, how did you get it? What happens when you click on her in the shop? Does the daily login screen come up? I just tapped on get I think. Three days and only one day is click able. 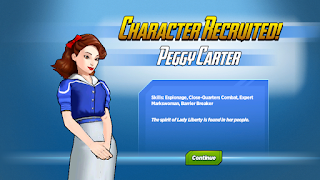 The Peggy Carter recruitment is severely broken. I have logged in every day and I am not being credited for it!